Finally, the Tournament of Power arc has arrived. 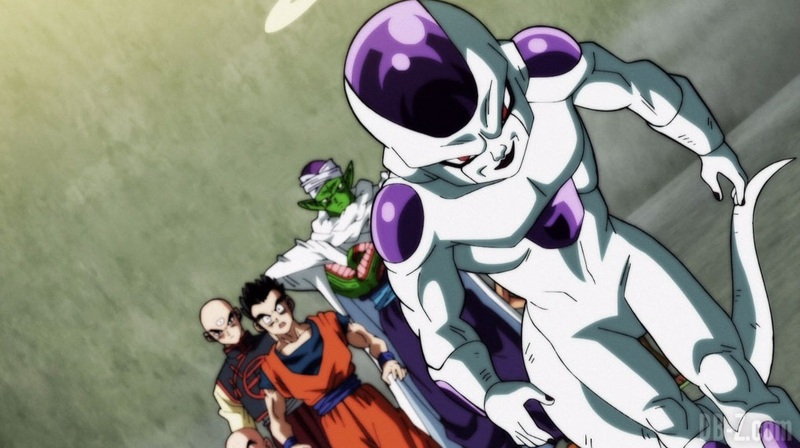 We’ve spent time watching Gohan regain his Ultimate power, Frieza joining Universe 7’s squad & watching backstabbing ensue between Gods & fighters. Now that the fighters from the different universes are togethr& are ready to participate in this dangerous & life-changing tournament, we can now sit back & watch our favorite fighters & some new faces put their lives on the line. The episode kicked off with The Great Priest reminding all of the fighters of the tournament rules. It was revealed to the fighters that the tournament will officially end after the pillar in the fighting ring has reached the bottom & once the 100 take (48 minutes) are up. Yes, unlined the Tenkaichi Budokai matches we are familiar with in Universe 7, this tournament is timed. Once the rules were announced, we got the chance to spend a few moments with some key fighters from the different universes. Kale, who we know has a Broly-like transformation, wondered the battlegrounds looking very nervous, while Goku stared down Troppo with the intent to go after him once the tournament started. Although Gohan is the team leader of Universe 7, it’s clear that very few fighters on his team respect him enough to listen. Piccolo, Krilljn, Rossi & Tien intend to follow his lead, but Vegeta, Goku, 17, 18 & Frieza are too high on pride to take Gohan’s leadership to heart. After The Great Priest told the fighters to fight, Universe 7’s plans went out the window. This wasn’t much of a surprise as Piccolo revealed earlier in the episode that due to Vegeta & Goku’stopped saiyan pride, they most likely would go in ahead & do their own thing on the field. The battle seemed somewhat one-sided because of Universe 3’s android Nariama, who performed a sweeping & hard hitting spinning attack across the area, which knocked some fighters around. However, the spinning attack was abruptly shutdown by Hit & Basil. Basilisk then finished off Lilibeu of Universe 10 by kicking her out of the ring with his energy attack. It was then that the fighters found out that once you’re kicked out ofnthenring, you end up on the bench next to your Universe leaders. The interesting thing about thevery first knockout was that Zenō-sama used a Godpad & pressed Lilibeu’s face on the screen. This is the way that the Zenō-samas will erase the fighters & their universes. Gohan, Piccolo, Krillin, Roshi & Tien found themselves surrounded by some fighters, but they were pretty confident that the plan Gohan laid out for this very situation would be successful. The attacks did land on each opponent, but the opponents were unaffected by their attacks, which shows that Base Gohan is still not as powerful as some thought. Because of Goku’s carelessness, Universe 4’s Nink grabbed him with the intent on jumping out of the ring with Goku in-hand. However, just as he made it out of the ring, Goku transformed into Super Saiyan Blue & unleashed energy propelled Nink out of the ring. The episode ended with Basil, Lavender, Bergamo, and two other warriors surrounding Goku with 47 minutes remaining in the tournament. Goku is still fighting in his base form to conserve energy, but he may soon need to tap into it again. The episode was solid, but it may seem a bit scattered at times. Being that this is a a battle royale, characters that we want to see collide won’t get any screen time unless some of the minor characters are kicked out of the ring. I do feel that they should’ve shown Kale or Caulifla throwing down, but I guess they’ll get their time to shine soon. I amean also looking forward to seeing how Frost & Frieza’s team up will pan out. Knowing that both of them can’t be trusted, it will be interesting to see just who ends up stabbing who in the back first. The interaction between Frieza & Frost was very interesting.